한국내 방방곡곡에서 모인 16명의 씩씩한 한국 렌더너스 회원들은 200K ACP Brevet를 하기 위하여 4월 1일에 해남에 있는 패밀리 마트에 모였습니다. 코스는 힘들었지만 16명의 모든 라이더들이 제한시간인 13.5시간 내에 성공적으로 완주하였습니다. –축하드립니다! 이벤트의 사진입니다. 우리의 라이드는 해남의 서쪽에서 남쪽의 진도로 시계 반대방향으로 돌며 진행 하였습니다. 첫번째 60km는 어느정도 평평하였고 봄양파가 여기저기 자라고 있는 농지를 통과해갔습니다. 해안을 따라서 있는 두번째 부분은 혹독한 높낮이 차이를 라이더들이 도전하였습니다. 해변, 산과 들 그리고 어촌의 풍경은 장관이었습니다. 가게 컨트롤의 점원들과 수품항 컨트롤의 절친한 경창관의 많은 도움 그리고 Jan Boonstra님의 도움으로 만들어진 라이더들의 진행을 돕기위한 완벽한 지도와 큐표에 감사드립니다. 이는 모든 한국 참가자들과 주한미국의 색소폰 연주자인 Dan McBride님에게 있어 첫번째 Brevet이었습니다! 강동균(22세)이 우리중 가장 젊은 라이더였습니다. 우리는 모두가 차후에 있을 많은 이벤트를 함께하리라고 기대하고있습니다. Quotes from riders:오창환(인천): 이것은 힘들었다! Daniel(서울): 다음번엔 내 색소폰을 가져올것입니다! Russell(대구): 헤페바이젠 맥주가 내 차 트렁크 안에 있다! 정치율(미량): 내 부모님은 이걸 미쳤다고 생각해! Ullrich(Munich): 한국의 풍경과 음식은 환상적이고 이 렌도넌스는 강하다! 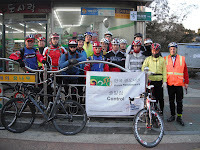 Sixteen hardy Korea Randonneurs, from every part of the Korean peninsula, congregated at the Family Mart in Haenam on April 1 to embark on the 200K ACP Brevet. The course was hard and all 16 riders successfully finished within the time limit of 13.5 hours - CONGRATULATIONS! PICTURES FROM THE EVENT. Our ride took us from Haenam west and then south to JINDO, which we circled counter clockwise. The first 60 km were rather flat and took us through farmland, with scallions growing everywhere. The second part along the shore was a relentless up and down and challenged riders. The vistas of the seashore, the mountains and the fishing villages were spectacular. Many thanks also to the clerks at the store controls and our friendly Policeman in the Supum Harbor control. The impeccable maps and cues sheets made by Jan Boonstra helped riders to navigate. This was the first Brevet for all the Korean participants and for Dan McBride, the saxophone player from the US army band in Korea! Kang Dong Kyun (age 22) was our youngest rider. We expect all of them to return to many future events. Oh from Incheon: this was hard! Dan from Seoul: next time I bring my saxophone! Russ from Daegu: the Hefeweizen beer is in the trunk of my car! Jeong from Miryang: my parents think this is crazy! Han Soon Kwon: I lost my Brevet card and had to turn around to find it! 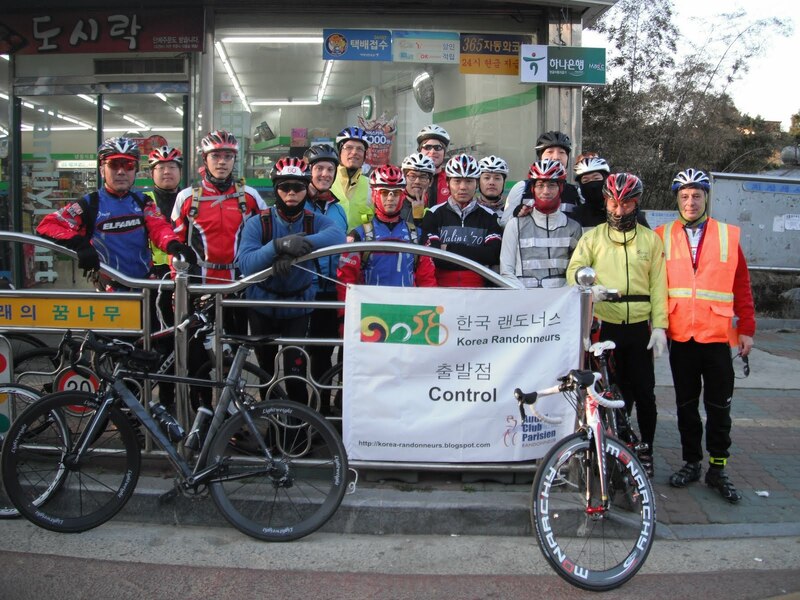 Uli from Germany: Korea's scenery and food are fantastic and it's Randonneurs are strong! 안녕하세요.일본에 살고 있는 kimko kimoto라고 합니다.